Here are the ways taken by our ball ( the blue line ) for full, half and thinness. We can observe several interesting points on these sketches. Maxi deflection angle will be obtained with an aiming full minus 1 or 2 mm ( right angle ). For an aimed specific quantity the trajectory of ball 1 will be a tangent at the ball 2 at the impact point. 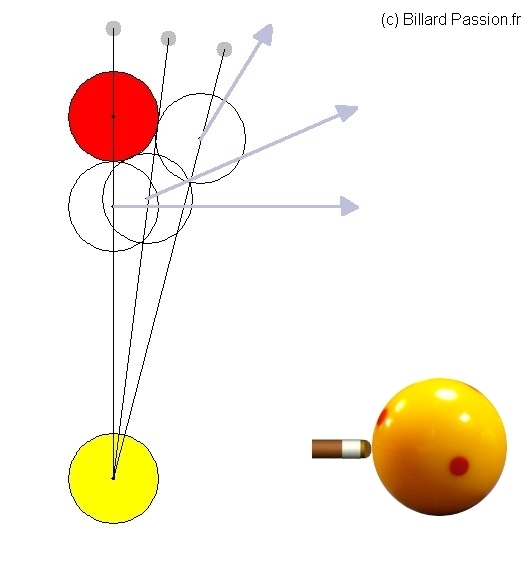 If balls 1 and 2 are not near one from another, or if the shot is not strong enough, a rotation will be induced. Instead of gliding on the table, the friction of the cloth will provoke a rotation onwards ( ahead shot ). --> It will be difficult to control the final deflection in relation to the aiming axis. This deflection will be less than the theoretical one. If the shot is stronger than normal an explosion phenomenon will take place. At the moment of the impact the ball 2 will throw off ball 1 to the side more stronger than normal. --> It could be interesting to use this technical shot in order to obtain more final deflection. Maxi deflection will be otained with an half ball aiming. Aiming between 1/3 and 3/4 the final deflection will be practically the same like 1/2 aiming ( natural shots ). --> it is a typically shot to choose when we are far from ball 2 because it is easy to make a little mistake with the quantity and have nevertheless the same result. Maxi deflection will be obtained with an aiming of half a ball. If we aim less than half a ball the resultant deflection will be srongly dependent of the shot itself. --> To avoid curved trajectories while shooting half ball strongly it is better to aim 1 mm fuller than half while raising slightly the cue (1 mm).